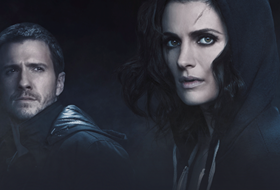 On ABC’s Monday 10 PM hit CASTLE, now wrapping its third season and renewed for a fourth, Stana Katic’s NYPD detective has an affectionate if often adversarial relationship with Nathan Fillion’s writer Richard Castle. On screen, Castle uses the no-nonsense Beckett as the model for his new literary heroine Nikki Heat. In person, Canada-born actress Katic (QUANTUM OF SOLACE, THE LIBRARIAN: THE CURSE OF THE JUDAS CHALICE, THE SPIRIT) comes off as being a bit softer and more cheerful than Beckett. The actress is no less busy than her character, though, so she can’t talk for long, but here’s what she has to say about being Beckett. ASSIGNMENT X: Have you done any research into police detective work since being cast as Beckett? KATIC: When we were working in New York City filming the pilot, I spent some time with detectives in New York. I think they were from the Ninth Precinct. They were really generous in showing me what it meant to be a detective and also just feeding me a lot of wonderful gallows humor that that kind of a dark field of study has. And then when I came to L.A. is when I got a chance to go and travel with a detective here [in the city where CASTLE has filmed post-pilot. It was a fantastic opportunity to see how important it is for detectives who are building a case to create a rock-solid case that’s impenetrable by the defense, and I think that’s a real driving force for my character, because she does have a history with unsolved crime and a tragedy [her mother’s murder] in her own background. It became really important for her to create a case that would never fall apart in a court of law. So it was very informative. They took me around and showed me [how to] Taser people. It’s wonderful. I did have the opportunity to do that. KATIC:Beckett’s got a different kind of quality from me, as far as serious about her work [laughs], and so there are times where I have to kind of work into the Beckett world on certain days, whereas other characters have been a lot closer to who I am naturally. AX: How would you describe the Beckett/Castle dynamic and how it’s changed from the beginning? 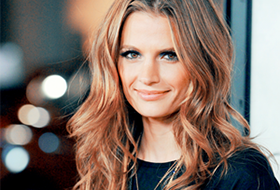 KATIC: I would say the usual stereotype for a female police officer is a strong, hard, by-the-book kind of character. And I think that’s what [series creator/executive producer/show runner] Andrew Marlowe is bringing is something that’s more classic and a throwback to a different style of filmmaking. Originally, Detective Beckett is annoyed that she’s in a way babysitting this superstar, who she obviously admires because she reads his books. As we move on in the series, though, the two of them gain real respect for each other’s qualities and for the way that they can handle a case. I think if we were to paint a parallel in order to understand what the dynamic really is, it would be closer to THE THIN MAN or HIS GIRL FRIDAY, where they both take turns benefiting from each other and bringing the lightness and the comedy in solving the cases, and bringing the intelligence and the heart, which in the end is kind of the thrust of the whole piece, isn’t it? AX: Speaking of the heart, what about the romantic possibilities between Beckett and Castle? KATIC:There’s a Lubitschesque [referring to the films of Ernst Lubitsch, who made such ‘30s and ‘40s romantic comedy classics as NINOTCHKA, HEAVEN CAN WAIT and TO BE OR NOT TO BE] quality. Lubitsch always brought this classic, subtle sexuality to his characters. I think that’s the aim, to bring this subtle elegance and sexuality and sleekness. As much as we’re antagonizing each other, we’re always attracting and admiring each other throughout, and it becomes stronger. AX: Do you have a proprietary feeling at this point toward the squad room set, like, “This is my domain”? KATIC: I don’t have a proprietary feeling. I do feel really collaborative with the other guys who play the detectives. I really enjoy working with everybody that’s involved in that part of the story. So I kind of feel like I share it with all of them. AX: When you began working on CASTLE, did you have any idea that it was going to turn into this big pop-culture hit? KATIC: You know, people keep telling me that it’s a hit, but what makes a hit, I’m not really sure what that means. Maybe because I’m in the work bubble, I don’t really get to see the effects of it, so I’m just grateful that it’s doing well, that we’re still on the air.